As standpoints intensify with Brexit approaching, and opinions varying from opportunity to calamity. What are the facts about our Textile trade with the EU? The first stop for Texintel was the Office for National Statistics and an in-depth analysis of the published Trade Figures. The EU has much to lose from not finding a workable trading formula for post-Brexit trade. 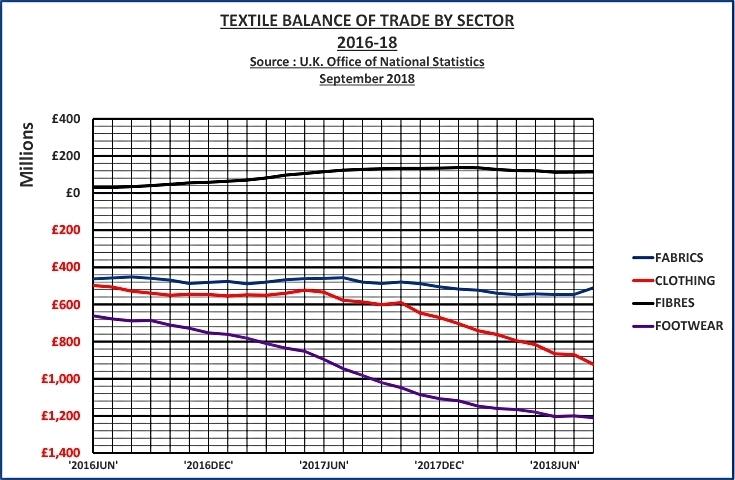 With annualised exports running at £9.12 billion and imports at £11.65 billion the current imbalance of trade with the EU is over £2.52billion, or nearly 28% of the total trade in Textiles between the UK and the EU. On the ‘contra’ side it is said that Immigration controls will strip the Industry of a cheap labour source, EU intellectual property rights will be lost, EU regulatory standards will be lost, EU start-up and research grants will go, and the imposition of duties into Europe will kill the export progress that the Textile Industry has made in recent years. On the ‘pro’ side it is said that the absence of cheap local offshore manufacturing in Europe will drive Textile jobs back to the UK, Bespoke Bi-lateral Trade Agreements with developing countries will tailor UK import duties with UK needs, Government promised initiatives on R&D will favour the UK Textile Industry (currently no 3 in the world for innovation), Regulatory harmony is already promised and Import Duties with the EU, will close down a substantial part of the European Entrepot Textile finished product trade. With today’s news from the Austrian press that M. Junker said “a deal could be agreed by November”.